Gene Robillard was a star quarterback and hockey player at Tech High Schol in Ottawa before going on to star at McGill from 1948 to 1951. Robillard was coveted by a number of CFL teams, but ended up signng with the Montreal Alouettes in 1952. Though Russ Jackson was still a few years down the road, the trend was pretty clear with most teams brining in import American quarterbacks. In Montreal, it was the start of the Sam Etcheverry era and a head coach in Peahead Walker who didn't care much for Canadians at the best of times, let alone at quqrterback. 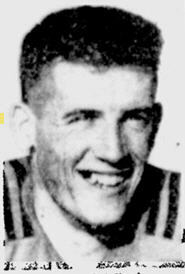 Robillard ended up playing Intermediate football back in Ottawa in 1952. Robillard went back to McGill in 1953 to finish his Education degree and then with the formation of the BC Lions in 1954, Robillard got a second crack at the pros with Leos. Robillard even saw a bit of game action at quarterback. Following his playing days, Robillard became involved in coaching and was the head coach of the junior Ottawa Sooners. Gene Robillard passed away on April 24, 2007. Note: The Montreal Alouettes do not list Robillard on their all-time roster in their media guide. The Canadian Pro Football Encylopedia by Tod Maher and Bob Gill lists Robillard with Montreal in 1952 for one game. A check of the Montreal Gazette, however, for 1952 doesn't show Robillard playing any regular season games. If anyone has additional information on this, please see the Contact Me link at the top of the screen.